The painting with this post was from a doodle I made after hiking out at the baylands and watching geese fly across an early moon. It’s a small painting, and destined for a friend of mine who’s in need of some magic. It’s a lovely synchronicity that this last night of our year 2009 there’s a full moon. And this full moon is special: it’s a blue moon, the second in the month. A regular full moon is often a symbol of the peaking of power, clarity, and general psychic hubbub, and some folks ascribe even more special powers to this bonus full moon. And this moon’s a triple magic bonus because it will succumb to a partial lunar eclipse (that most of us won’t be able to see, darn it). According to a 1998 Old Farmer’s Almanac, each moon has an attribute. The December full moon is the Cold or Oak Moon. The January full moon is the “Wolf” moon, “After-Yule” moon, or “Old” moon. But for all the 12 months on my old Almanac calendar, there’s nothing about any geese in the moon. 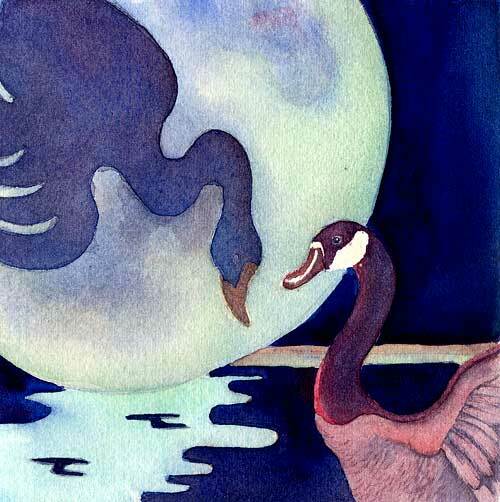 So I’m going to call this last blue moon in 2009 the “Goose” moon.